This herb has been utilized by the Native Americans for over 200 years. The Native Americans discovered that the root of this plant helped many ailments including menstrual cramps, menopause and stomach based ailments. It is still used today by many for ailments such as hot flashes, bowel inconsistency, irritability and mood swings. They also used it for sore throats, snake bites, nervous disorders just to name a few. Black Cohosh has been the herb of choice for women looking for alternative methods of relief and treatment of various disorders. 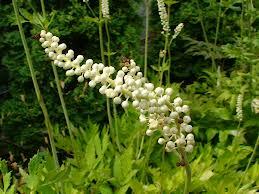 In today’s world Black Cohosh is utilized by primarily women looking for comfort and relief due to menstrual problems and various ailments of that nature. 1. Black Cohosh and Menopause– Black Cohosh has been known to help severe menstrual cramps, mood swings, hot flashes depression, lack of sexual interest, among other ailments related to menopause. This gives women a natural alternative to estrogen hormone replacement products. 2. Black Cohosh and Menstrual Cramps/pms – Black Cohosh has been hailed as an awesome alternative to all the dangerous drugs women take in order to get some relief from the bloating, constipation, irritability, mood swings and so on. 3. Black Cohosh for Male Infertility- Not only is it great for women, but men as well. Studies have found that men and women who supplement with Black Cohosh have higher chance of having a child. In women it acts like a natural estrogen which makes fertility much higher than without it. In men it also protects the sperm and the efficiency of the sperm therefore creating a higher chance of pregnancy. 4. Black Cohosh and Arthritis- Recent reports have found that supplementing with the wonder herb may reduce the severity of pain by as much as 50 percent. It helps with the reduction of inflammation in the joints, therefore creating comfort as the end result. 5.Black cohosh and Cholesterol- It was also found helpful in lowering bad cholesterol levels and preventing low density lipoproteins from being deposited on the walls of the arteries. This may be an alternative to conventional methods of treatment. Black Cohosh has been said it helps to induce labor by helping your body to produce its own oxytocin to help ripen the cervix and open it up for labor. However, you should not undertake this task at home; it must be under a highly trained mid-wife or natural obstetrician. Before supplementing with it seek the advice of a trained professional so that you won’t have any complications with your pregnancy. Supplementing with Black Cohosh can help provide relief, because it has some strong anti-inflammatory properties within it. Studies have found that many whom have supplemented with it have found that it helped the systems by at least 40 percent. moderation, remember anything in excess can be bad for you! AN EXCELLENT VIDEO I FOUND ON THE BENEFITS OF BLACK COHOSH!